199. The potential for spiritual influence to be exercised in society may be increasing, and it is important that the legislation unambiguously protects voters of any faith from having their religious beliefs manipulated in order to prevent them freely exercising their vote. Bullying a voter by asserting that they will ‘burn in hell’ for not supporting a candidate is ultimately no different from threatening physical violence or from an employer threatening to sack a worker. 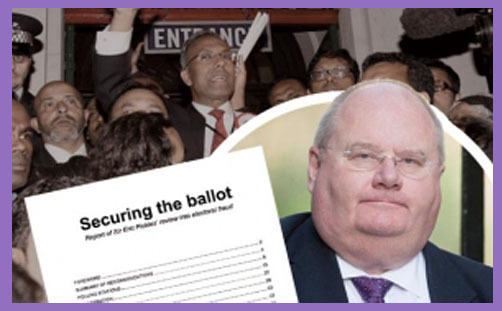 Freedom of worship and the right to vote are important and hard-fought British liberties. Britons should be able to exercise both those liberties without injury or intimidation. It is an interesting proposition in the 21st century of pervasive secularity that spiritual injury should be considered equivalent to physical injury. Where does the crime of ‘undue spiritual influence‘ begin and end? If it should be illegal to threaten a voter with Jahannam and al-Nar for voting against Allah’s chosen political candidate, what about threats of purgatory for Roman Catholics who vote for abortion-supporting candidates, or the menace of being reincarnated as a dung beetle in the great Karmic wheel of universal justice? Who determines what constitutes a spiritual threat? Who discerns whether a sermon has had spiritual influence? How can the police (for, presumably, it is they) judge whether an imam, rabbi, priest or pujari has asserted spiritual influence and that such influence is undue? Is it not the primary duty of religious leaders to keep their flocks on the narrow path that leads to Heaven/Janna/Nirvana? Might not a perceived threat of hell actually be a righteous exhortation to follow the author and finisher of the faith? If the reality of sin and the consequential inevitability of hell should be considered equivalent to threats of physical violence, then we move into a realm where preaching the truth of salvation at election time becomes a subversive act. If it be bullying to assert that a voter will “burn in hell” for not supporting a candidate, how is it any less bullying to assert that a voter will find reward in heaven for supporting a candidate? If threats of damnation are unduly coercive, what of assurances of salvation? ‘Neither is there salvation in any other: for there is none other name under heaven given among men, whereby we must be saved‘ (Acts 4:12). Neither is there political enlightenment in any other candidate: for there is no other name in any party who can bring peace, truth or justice into the world. You may demur, but who are you? You may spiritualise your earthly motives, but why shouldn’t you? Faith in Jesus Christ is essential for spiritual salvation (16:31). Voting for a particular candidate may be considered essential for temporal peace and justice. How can the police and courts really determine where freedom of religion infringes the freedom to vote, especially where there is little apprehension or understanding of what may properly be considered ‘spiritual’?